Easton Velocity, a service of Easton Utilities is embarking on a system-wide technology upgrade to improve the infrastructure that delivers high-speed internet to current customers. The upgrade will offer increased speeds of up to one gigabit (down), 100 Mb (up), improved reliability, and the capacity to support next generation services. 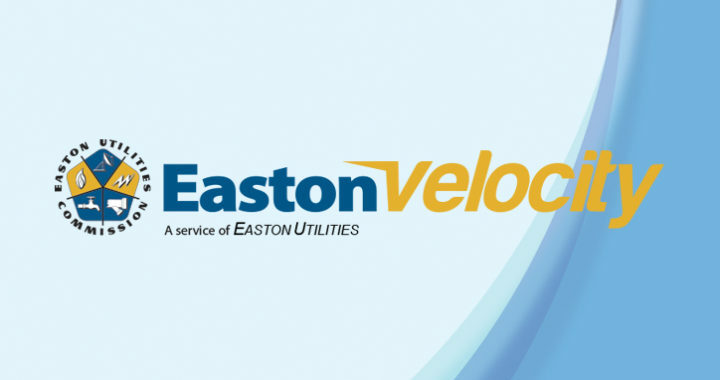 “We are excited to bring this level of service to our customers in Easton who expect quick and seamless connectivity,” stated Ted L. Book, Director of Easton Velocity. Construction is expected to begin in early September and will last approximately two years for full completion. The project plan focuses on work by specific locations to ensure the least amount of disturbance for residences, businesses and traffic. “We are asking for patience and understanding from our customers and all residents of our community so we can deliver the services they are demanding,” added Book. More details will be forthcoming as Easton Velocity is committed to keeping people informed and are constructing a page on their website at eastonvelocity.com with real-time information. “This significant investment and dedication of resources will ensure Easton has extremely fast internet which is crucial for quality of life and economic development,” said Hugh E. Grunden, President and CEO of Easton Utilities. The award-winning Town of Easton supports a variety of businesses, arts, culture, excellent dining experiences, a busy airport, access to large metropolitan areas, great health care, and a unique quality of life overall.